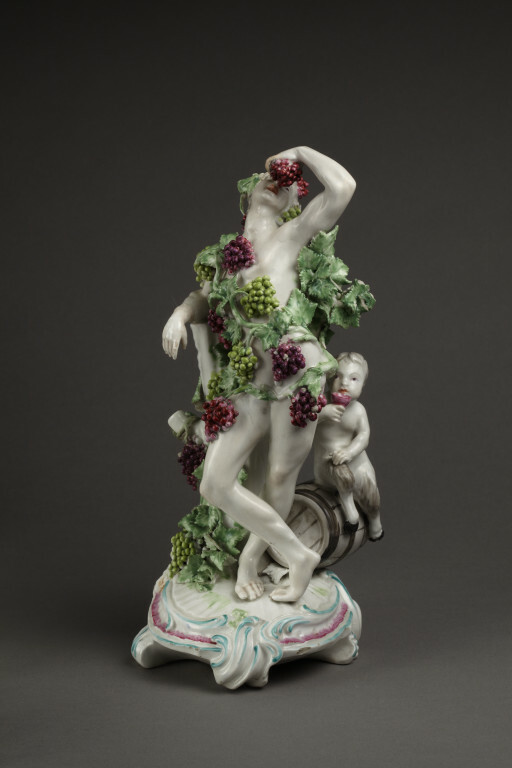 Figure in soft-paste porcelain, painted with enamels, of Bacchus with a youthful satyr, representing Autumn, and Bacchus stands by a tree stump from which springs a vine with bunches of green and purple grapes and foliage, and the branches of the vine are wreathed about his naked body, and with his left hand he holds a bunch of grapes above his mouth, and the satyr is seated behind him on a barrel with a cup held to his lips, and they are both supported on a rococo scrolled base. Purchased by Lady Charlotte Schreiber from Van der Pluyne (or Plyune), Rotterdam, for £8 in October 1873. 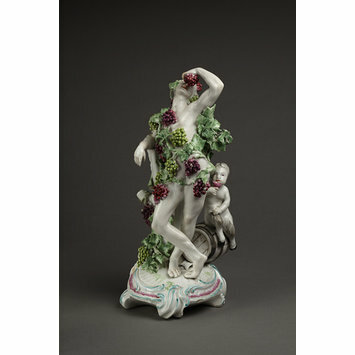 Figure in soft-paste porcelain, painted with enamels, of Bacchus with a youthful satyr, representing Autumn, from a set of The Classical Seasons, made by William Duesbury & Co., Derby, 1765-1770. Label - copied from a Meissen figure probably modelled by Eberlein ca. 1740.